With the ever changing economic climate, many organizations are periodically adjusting their resources to align with business strategy. This often results in the need to achieve more work with fewer resources. In order to remain successful, businesses must become more efficient, reduce waste and thereby reduce cost. We must find ways to do what we are currently doing in less time and at a lower cost. One way we can accomplish this is through the use of 5S Principles. 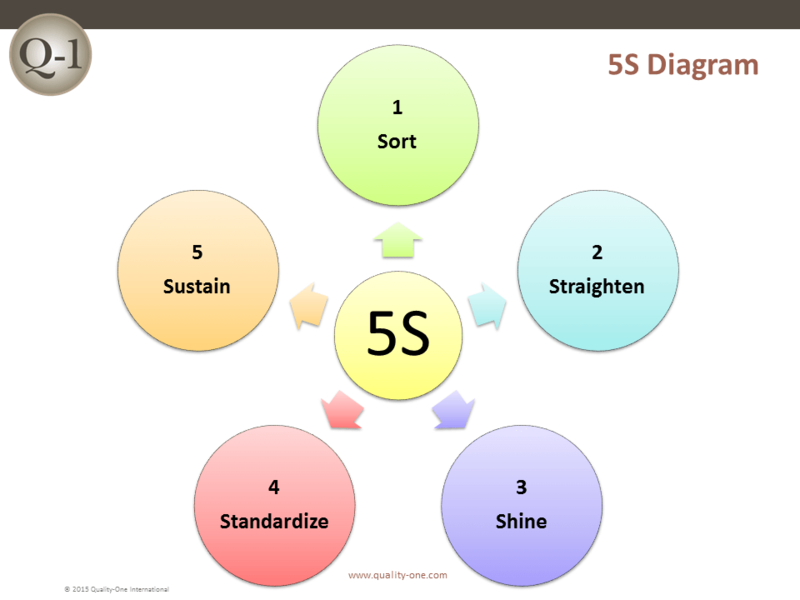 The 5S Principles are very effective at identifying and eliminating waste and increasing efficiency. There is a lot of information about 5S and how it came to be. The popular belief is that the Japanese invented the 5S Methodology because the letter “S” stands for five Japanese words, that when translated to roman script, start with the letter “S”. In actuality, the principles within 5S were being utilized decades before by Mr. Henry Ford. It has been reported that prior to 1920, Mr. Ford was using CANDO in his manufacturing processes. The acronym CANDO stands for Cleaning up, Arranging, Neatness, Discipline and Ongoing improvement. In the 1950s, representatives from Toyota visited the Ford facilities to be trained in automotive mass production methods. The Japanese later adapted the CANDO methods and applied them in their production facilities. Some commonly used words describing the steps in 5S are Sort, Set, Shine, Standardize and Sustain. Throughout different companies, various words are used that have similar meanings. No matter what specific words are used to identify the steps in 5S, the purpose remains the same: create a clean, organized and efficient work environment. The 5S Principles are recognized in many industries as effective tools for improving workplace organization, reducing waste and increasing efficiency. Organizations should be careful to not allow the 5S Principles to become viewed as the whole of the company’s improvement efforts. Otherwise it could become the end goal of your company’s improvement process instead of a key part of a larger continuous improvement journey. The greatest benefit from using 5S is realized when it is part of a larger initiative and the entire organization has adopted its principles. 5S is more than a system; it is a business philosophy and should be integrated into the organization’s culture. There are many benefits to implementing the 5S Methods into a work area on the production line or in the business office. To not only survive but thrive in business today, cost must be controlled and waste must be avoided or eliminated. The 5S steps, when implemented properly, can identify and reduce many forms of waste in any process or workstation. An organized work area reduces excessive motion and wasted time looking for the right tool. The visual aspect of the 5S Methodology is also very effective. When everything has a place, it is easier to spot something missing or misplaced. A clean work area helps draw attention to possible problems or safety hazards. A clean floor helps spot any leaks or spills could indicate machine maintenance and prevent slips and falls. Furthermore, encouraging people to watch for and address problems can result in a positive change to an organizations culture. Therefore, the 5S Principles implemented as part of a larger Lean initiative or as a standalone tool can reduce waste, improve quality, promote safety and drive continuous improvement. The first step in 5S is sorting. During sorting the team should go through all items in the work area including any tools, supplies, bulk storage parts, etc. The 5S team leader should review and evaluate every item with the group. This will help to identify which items are essential for getting the job done effectively and efficiently. If the item is essential for everyday operations it should be tagged and cataloged. If the item is not essential, determine how often it is used in the performance of work in that area. If it is a bulk item, decide the proper amount to be kept in the area and move the remaining quantity to storage. Excess inventory is one form of waste and should be eliminated during the 5S activities. Designate a place for all items that remain in the work area. Put all items in their designated location. An often referenced quote is “A place for everything and everything in its place”. During the straighten step, look for ways to reduce or eliminate waste. One form of waste in a process is unnecessary operator motion or movement. Therefore, frequently used tools and supplies should be stored in the immediate work area close to the operator. One effective method commonly used to avoid wasted time searching for the correct tool is constructing shadow boards for all essential tools. Items that are not used as often should be stored based on their frequency of use. All parts bins should be properly labeled. The label should include part number, part description, storage location and the recommended min / max quantities. A properly straightened work area allows the operator to quickly review and verify that they have everything they need to successfully perform their task at hand. The next step is to clean everything in the area and remove any trash. To be effective we must keep the area and any related equipment clean. Dirty process equipment can actually increase the potential for process variability and lead to equipment failure. Lost time due to equipment failure is considered waste and non-value-added time. A dirty area can also contribute to safety issues that have the potential to cause a worker to be injured. Operators should clean their areas at the end of each shift. By doing this they will likely notice anything out of the ordinary such as oil or lubricant leaks, worn lift cables, burnt out bulbs, dirty sensors, etc. The purpose is to reduce waste and improve operator safety and efficiency. The fourth step has been called the most important step in the 5S Process. In this step we must develop the standards for the 5S system. They will be the standards by which the previous 5S steps are measured and maintained. In this step, work instructions, checklists, standard work and other documentation are developed. Without work instructions or standard work, operators tend to gradually just do things their own way instead of what was determined by the team. The use of visual management is very valuable in this phase. Color coding and standard colors for the surroundings are sometimes used. Photos of the area in the standard 5S configuration are often posted for easier identification of non-conformance’s. The operators are trained to detect non-conforming conditions and correct them immediately. Schedules should also be developed for regular maintenance activities in each area. This step in the 5S Process can sometimes become the most challenging of all the five steps. Sustaining is the continuation of the Sort, Straighten, Shine and Standardize steps. It is the most important step in that it addresses the need to perform 5S on a consistent and systematic basis. During this step a standard audit system is usually developed and implemented. The goal of the sustain step is to ingrain the 5S process into the company culture. The company must strive to make 5S a way of life so the benefits gained through the exercise can be maintained. 5S is not a one-time exercise. Following the 5S Process must become a habit. Some organizations have added an additional step and titled their process 5S + 1. The additional step being applied is safety. The goal of adding this step is to foster a culture that enhances safety by identifying any workplace hazards and removing them. In addition, tools and workstations are selected or designed with proper ergonomics in mind. The emphasis being that in each of the other 5S steps the motto is “Safety First”. Many companies have implemented 5S into all areas of their business. The greatest benefits are usually realized when 5S is implemented as part of a larger Lean initiative within the organization. If implemented properly, 5S can help drive your company’s lean initiatives and be a powerful stimulus for developing a continuous improvement culture. Overproduction – Producing more product than required or producing parts faster than the downstream processes can utilize it. Strive to produce the proper amount at the proper time. Excessive Inventory – This can be a direct result of overproduction or it could be due to poor purchasing practices. Over purchasing supplies because we got a great deal sometimes is no deal at all. Excessive or unneeded inventory can propagate other forms of waste. Inappropriate or Non Value Added Processing – Waste is incurred through use of the wrong tool, performing needless operations or not using the most efficient processes or tools for the job. Beware of the phrase “Because we have always done it this way”. The right process and the correct tools can reduce waste in your process. Waiting – Time and resources are wasted when waiting on parts, supplies or information. Transportation – Excessive travel or movement of materials is waste. Proper planning and process layout can help reduce or eliminate excess transportation. The use of value stream mapping can help the team visualize exactly how much the material is traveling. Unnecessary Motion – Any movement or motion performed by the operator that does not add value is waste. During your 5S exercise examine the motions required to perform the task. Organize the workstation so all tools and supplies are easily located and within easy reach. In some cases, re-sequencing certain process steps can reduce excessive and redundant movement or motion by the operator. By reducing or eliminating the waste of excess motion you are also creating a more ergonomic workstation. Always consider safety first. Defects – This form of waste is one of the worst of all. Producing non-conforming parts or assemblies increases scrap, reduces process efficiency, wastes machine, process or assembly time and causes non-value added tool wear. Defects can also create additional waste in the form of wait time when the downstream operations run out of usable parts. Untapped Employee Creativity (potential) – Many companies are now realizing that their best asset is their employees. Companies must create an atmosphere where ideas are encouraged. Some of the most successful organizations have created a culture where employee’s ideas are really heard and evaluated. When their good ideas are implemented, the employee is recognized and rewarded. You never know where the next great idea is going to come from. When you are implementing your 5S program or other lean tools watch out for the various forms of waste. Take action to eliminate waste in your processes. Get the team members involved and encourage them to provide ideas for improvements. When teams work together to recognize, address and eliminate waste and improve their workplace, they will take ownership of the process. They are more likely to spot any non-conformance’s in the future. The 5S Principles will gradually become a habit. Then you will begin to foster a culture of continuous improvement. Quality-One offers Quality and Reliability Support for Product and Process Development through Consulting, Training and Project Support. Quality-One provides Knowledge, Guidance and Direction in Quality and Reliability activities, tailored to your unique wants, needs and desires. Let us help you Discover the Value of 5S Consulting, 5S Training or 5S Project Support.